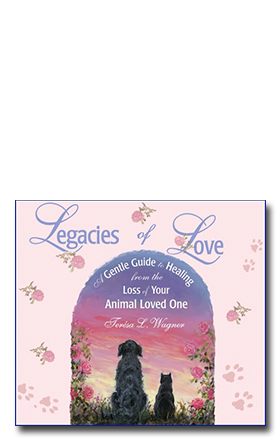 A beautiful 4-disk, audio book on how to cope with the loss of a beloved animal companion. The three hours of running time includes an original score of soothing music and a guided meditation. When we connect in love, when we ask and listen and speak with love, it is impossible for our animal in spirit to not receive our messages. No matter how much emotional pain there may be of grief, when we connect with the soul of our animal, the heaviness of grief in us is diminished—even if only for moments. The healing of those moments becomes part of us, and the power of grief to devastate us is lessened. And we are more free to support our animals and ourselves as we grieve.